The central challenge for Arizona and many other arid regions in the world is keeping a sustainable water supply in the face of rapid population growth and other competing demands. 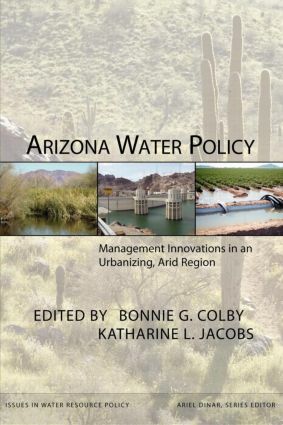 This book highlights new approaches that Arizona has pioneered for managing its water needs. The state has burgeoning urban areas, large agricultural regions, water dependent habitats for endangered fish and wildlife, and a growing demand for water-based recreation. A multi-year drought and climate-related variability in water supply complicate the intense competition for water. Written by well-known Arizona water experts, the essays in this book address these issues from academic, professional, and policy perspectives that include economics, climatology, law, and engineering. Among the innovations explored in the book is Arizona�s Groundwater Management Act. Arizona is not alone in its challenges. As one of the seven states in the Colorado River Basin that depend heavily on the river, Arizona must cooperate, and sometimes compete, with other state, tribal, and federal governments. One institution that furthers regional cooperation is the water bank, which encourages groundwater recharge of surplus surface water during wet years so that the water remains available during dry years. The Groundwater Management Act imposes conservation requirements and establishes planning and investment programs in renewable water supplies. The essays in Arizona Water Policy are accessible to a broad policy-oriented and nonacademic readership. The book explores Arizona�s water management and extracts lessons that are important for arid and semi-arid areas worldwide. ByJack L. August, Jr. and Grady Gammage, Jr.